However, we recommend adding all of the registration fields available. The password field will not be visible in this section due to some previous Ninja Form plugin changes, however, we recommend adding it so your affiliate's can set their password while registering. This way they can login when ready (or approved) and not be redirected through a password reset process which is not the best on-boarding experience. To access and add the Password and Password Confirm fields, scroll to the top of the field list and type 'password' in the top search area where it says Filter, and when visible, add them to your form. 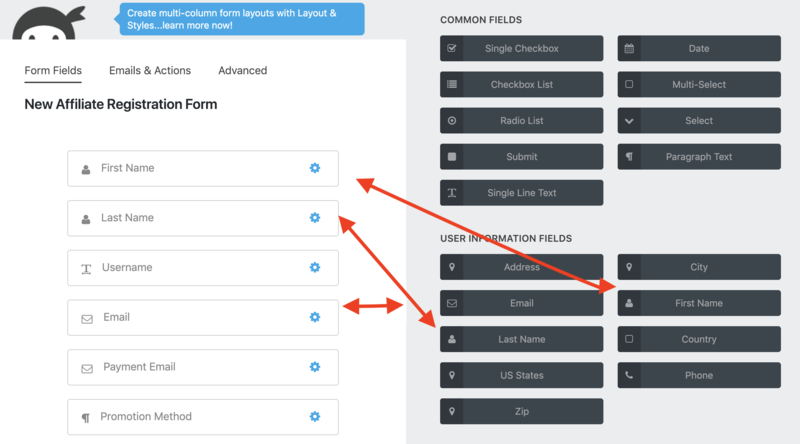 When you are finished adding the fields you would like to include, click the Done button in the top-right corner, and then click to Publish your new Ninja Form. Setup is not complete, but saving your form now is necessary. You will return to this form in a later step to finish the affiliate registration configuration. 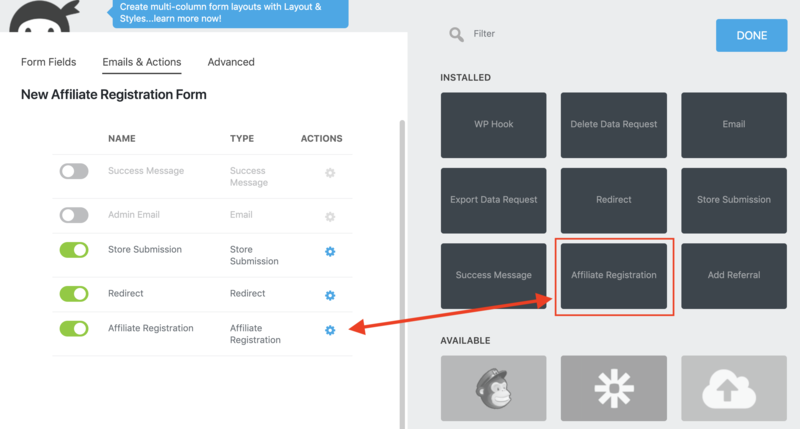 Next, shift over to the settings of AffiliateWP, go to Affiliates→ Settings → Ninja Forms and select the form you just created to use for affiliate registrations and Save Changes. Now, head back into the Ninja Forms form edit area. 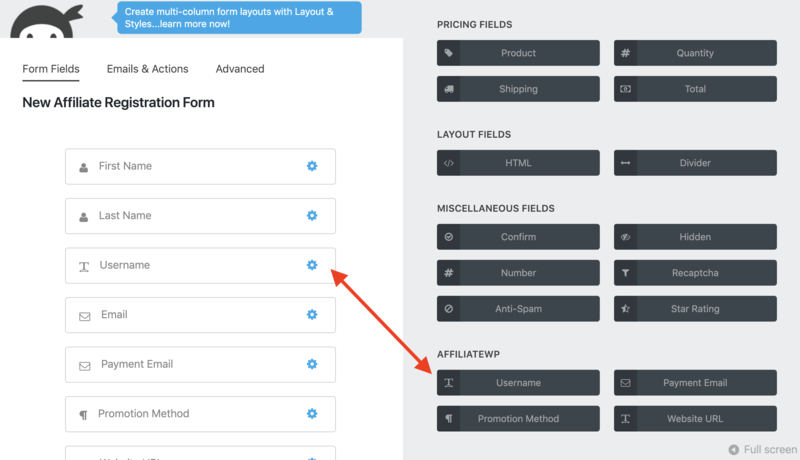 We'll need to tell Ninja Forms which fields should be used for AffiliateWP field data so the form submission can be recognized and create a new affiliate account. Next, click the cog wheel to bring up the Affiliate Registration field list. 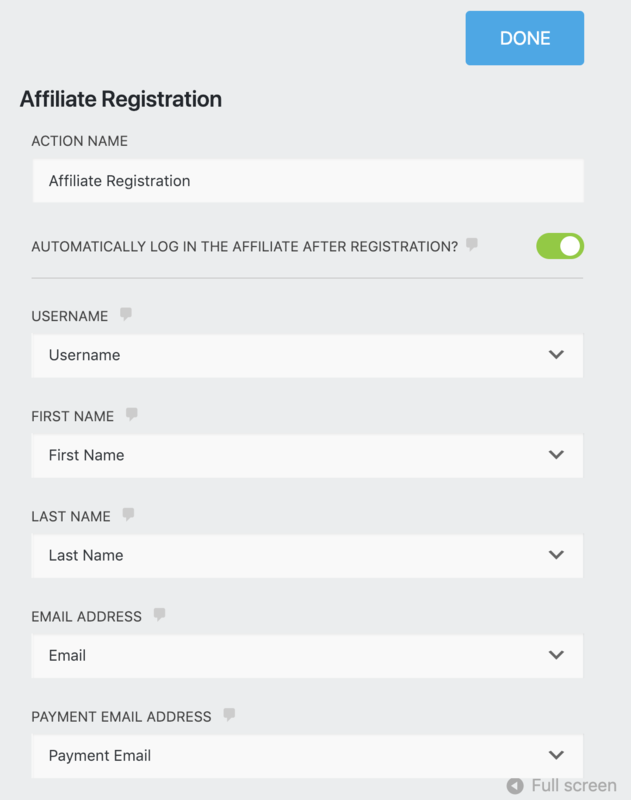 In each of the dropdown options, select the field to connect to the matching default affiliate registration field. If you do not see a field to match with, make sure you added the correct field types as noted above in Step 2. Note: If you don't see any fields at all, meaning it's blank, head back to Step 4 and verify you completed the form selection. Until you set the Ninja Form you plan to use for affiliate registrations, the list of fields to connect will not appear. Make sure to click Done and Publish the form again once you are ready. That is it, you are finished! Now it's time to go test an affiliate registration! After you've successfully imported the form, go to Forms → All Forms, and you'll see a new Affiliate Registration Form and can proceed with the configuration steps above. Note: You can only have one Ninja Form designated as the affiliate registration form.